Was it actually a plausible future history in 2001, even pre 9/11? I’m Ausralian (and have bugger all knowledge of music) so quite a few the political and musical references meant very little to me. But the impression I got – one that’s possibly wrong-headed – is that this is a thought experiment of Jones’ own devising, that she’s not interested in predicting the future as such, but at playing around with the idea of a burgeoning utopia that’s being formed while – and this is the most interesting bit – the apocalypse (or end of civilisation as we know it) is still happening. Some of the worst disasters only happen after the Ax and his movement are formed. I also didn’t think that the terrorism aspect was low down on the mix. In fact I think the constant threat of terrorism, whether it’s an Islamic uprising, a computer virus or green facists mining a beach, motivates much of what Ax does. Was it actually a plausible future history in 2001, even pre 9/11? I doubt it; but I think that, at least for me, it would have felt differently implausible. In 2001 I think I would have felt the wish-fulfilment (ironic, but even so) aspect more strongly; in 2011 I feel it as a road not taken. In fact I think the constant threat of terrorism, whether it’s an Islamic uprising, a computer virus or green facists mining a beach, motivates much of what Ax does. But those things aren’t described as terrorism. They’re described as war, or accident, or something else — the references to terrorism are specific tactics and incidents, and not the main thrust of the narrative. Very different to the tone of something like MacLeod’s The Execution Channel. I was never really convinced by the “counter-cultural” label, which seemed to me to belong to an earlier decade. And while it was a stretch from pop stars lining up to endorse a political party to actual in-power politicians asking pop stars for advice, it was mostly a forgivable conceit. Except for the coup. That took some swallowing. Cf A Very British Coup by Chris Mullin. Also, it frequently struck me while reading the books that they were more about Fiorinda than they were England. @Niall – You’re right, of course, that Jones’ doesn’t describe those acts as acts of terrorism. However, I was bringing a 2011 reading to the novel where terms like “war” and “terrorism” have become so muddled that, while an Islamic uprising might be described in the book as a small scale war, in my mind – based on how it would be played out today – it feels like a prolonged act of terrorism. Ian S: Luckhurst compares the Think Tank to the Creative Industries Taskforce, and it does look like an obvious point of inspiration. Without the coup, obviously. I’ll be moving on to the characters tomorrow, but I didn’t find Fiorinda the dominant presence you did; I think this is Ax’s book. Ian M: “A 2011 reading” — Ah, I think we’re not coming from such different places after all. For me, in my 2011 reading, while I fully agree the terms have been (deliberately) muddled, there were enough markers in Bold as Love to the effect that it didn’t agree with that muddling that I felt some dissonance. I mostly enjoy Gwynneth Jones’ work very much and often have to re-read stories several times, with greater appreciation each time. 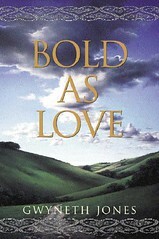 But I have always had a problem with the “Bold as Love” books. It has something to do with the callous dismissal of most of the population of Britain. What do all these people eat and how do they survive when the holier-than-thou eco-terrorists destroy the crops. Does Jones really think that a series of massive music festivals will cause people to forget the troubles in their lives? We only see the world through the eyes of the self-obsessed rock stars and their entourage and a few organic holdings. Where are the people in the cities? Have they conveniently died out? Will the conversion of one of the protagonists to Islam suddenly bring about the end of a bloody civil war? I just find a lot of the book to be a spaced-out hippy fantasy. Part of the problem is that I just don’t like the three main characters. I accept that characters don’t have to be appealing, but after several readings I still find it hard to distinguish between the Arthur and Lancelot figures. It doesn’t help that their names are Ax and Aoxomoxoa, and Fiorinda never becomes, for me, more than a spoiled rock chick. Niall: perhaps Fiorinda looms so large for me because I’ve read all five books… and looking back they seem to be one story about Fiorinda, which in turn becomes a second story about the fifth general. Also, there don’t appear to have been any actual creative types involved in that Taskforce – it was CEOs only. Paul Smith is a creative. It might be worth considering the more prosaic real world example of what happens when rockstars are invited to work for Government though. I just find a lot of the book to be a spaced-out hippy fantasy. I don’t agree with this, if only because of your first point: the characters are not virtuous, and although they consider themselves to be striving for utopia, it’s not at all clear to me that we’re meant to believe they’re achieving it. Although I would argue that Ax is positioned as heroic, that positioning is tempered by moments such as his declaration that overpopulation may be “a price we have to pay”, something to get through (there is a later acknowledgement of the human cost this implies). It is a bold book. I don’t think plausibility comes into it, or at least it only comes into it at a symbolic level. What Bold as Love does is fictionalise Britain at that curious point – Niall captures this very well – when the country was still in its false post-Blair euphoria, when although we *knew* it was false, it hadn’t been proved yet. Bold as Love exposes that illusion and shows other currents underneath: the countercultural currents that still are a huge part of English culture whether expressed in the English sf tradition of post-war disaster and new wave or in the festival culture that survives from the late 60s (think also 80s CND etc). In fact it brings these currents together and actually depicts an English radical tradition that has been very successfully and deliberately ideologically obscured since the late 80s. On an everyday level, I don’t think I could easily fit in to that counterculture as it now exists but one of the strengths of this novel is that allowed me as a reader to symbolically align myself with it. To imagine a future that was different – one in which there isn’t compulsory whiteness, compulsory heterosexuality or a patriarchal order. It is difficult to imagine ourselves out of the repressed, hierarchical system we live in (and there are traps of falling into closed utopianism) and this book (and series) seems to me to be one of the most sustained and successful attempts to do this of recent years. I think it is the (updated) equivalent of the 70s US feminist SF classics. Yes. Well, I wasn’t sufficiently politically aware at the time to really know it was false, but still. What do you mean by “closed utopianism”? I meant ‘we’ unconsciously knew it was false but were still happy to be fooled at the time – because it seemed infinitely better than the previous 17 years had been. On the day after the election in 97, people were going round in a slap happy kind of way greeting strangers (well they were in Brighton at least) and there were the scenes in the London streets (which we now know to have been staged). I quite happily bought into it even though I really should have known better (and had for instance left the labour party sometime previously in protest at Blairite changes). A weird time – your analysis brought it back to me. Closed utopia – well one that is based around certain ideals as opposed to something more multiple and fragmentary. So for example possibly the one in Woman on the Edge of Time might be considered too closed. Or it might be seen as a second wave feminist utopia whereas Jones is more third wave. Of course, you have to have a second wave, before you get to the third. There are better examples but can’t think of any off top of my head. Oh … News from Nowhere springs to mind.